China Academic Digital Library Information System (CADLIS) is a national project funded by the Chinese government and steered by the National Administrative Center for China Academic Library Information System (CALIS) which is a nation-wide academic library cooperative with over one thousand member libraries in China. By leveraging cloud computing technology, the new-generation CADLIS is an open framework and infrastructure, designed to help academic libraries to build and support large-scale federated academic digital libraries of high-quality scholarly information resources which are constructed and shared by CALIS members. This paper gives an overview of CALIS and CADLIS, and then describes two kinds of services, the overall architecture and interoperability of new-gen CADLIS, the related standards and specifications, newly-built and imported digital resources, etc. It concludes by discussing the current status and future development of CADLIS. The China Academic Library and Information System (CALIS)1a nationwide academic library cooperative, is steered by the National Administrative Center for CALIS, under the leadership of the Ministry of Education of China, and funded by the Chinese government. The mission of CALIS is to organize, promote, maintain and improve library resource sharing and technology innovation among Chinese academic libraries (as members of CALIS), and to provide a scholarly information service for Chinese universities, educational institutions, and the public. 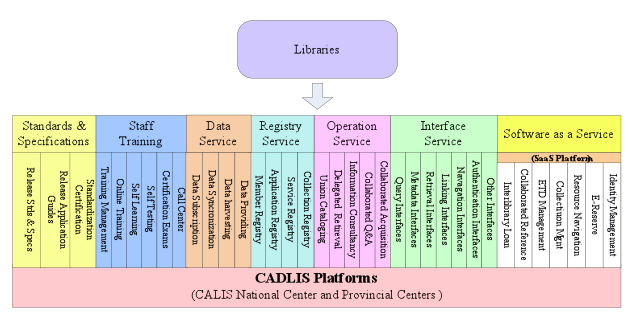 The China Academic Digital Library Information System (CADLIS) [1,2,4,5] federates digital libraries for higher education and academic libraries. It was first built in the CALIS Phase-II Project beginning in 2002. The new-gen CADLIS was started in the CALIS Phase-III Project beginning in 2009. CADLIS' services include union catalogue, inter-library loan and document delivery, collaborative virtual reference, networked e-reserve, networked thesis and dissertation (ETD), networked digital collections for disciplines, e-journals, e-books, et al. Many new-gen services are provided in the Software as a Service (SaaS [7-9]) model. 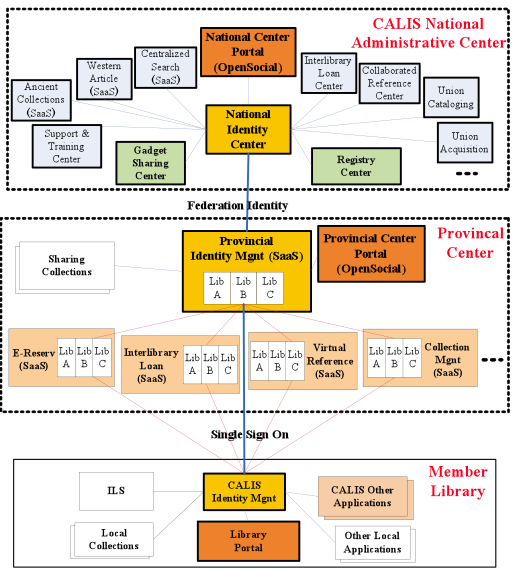 During the development of CALIS projects (from Phase I to Phase III), the National Administrative Center for CALIS united and organized Chinese academic libraries to establish three levels of information centers (national level, regional level and provincial level), to organize and subsidize members to build digital collections cooperatively; to build central union databases by harvesting local collections; to integrate resources and services from members and third-party resource providers; to formulate a series of technical standards and specifications for CADLIS; to provide a group of applications (in standalone or SaaS model); and to build tools which allow members to build and interconnect central and local digital libraries. This paper first gives an overview of CALIS and CADLIS, and then describes the services provided by the new-gen CADLIS. The overall architecture of the new-gen CADLIS based on the CALIS easyCloud framework , along with service integration and interoperability at different levels within the overall digital library, are presented in detail. The technical standards and specifications critical to building CADLIS are introduced. A large number of resources will be newly constructed and imported cooperatively. Finally, the current status and future development of CADLIS are discussed. CALIS Phase-I , one of the national projects of China's 9th Five-year Program, was first proposed in August 1996, and started formally in 1998, with a total investment of 62 million Yuan RMB (approximately $7.5 million US) from the Chinese central government. The National Administrative Center for CALIS was instituted at Peking University. Four national subject information centers and seven regional information centers were set up in 11 university libraries respectively. Sixty-three academic libraries from top-100 universities became the first core members of CALIS. Some special collections built by members were given financial aid by CALIS. When the Phase-I project was finished in 2001, the largest Chinese union catalogue from over 400 academic libraries was established. CALIS Phase-II [1,5] started in 2002 and ended in 2006, as one of the national projects of China's 10th Five-year Program, with a total investment of 150 million Yuan RMB (approximately $18.1 million US). Its main purpose was to build the China Academic Digital Library Information System (CADLIS), which is a nation-wide, distributed, federated digital library for higher education and academic libraries, and to expand and reinforce the organization and service networks of CALIS. The National Technology Center and National Union-cataloging Center of CALIS were set up in 2002. Fifteen Provincial Information Centers were set up in 15 university libraries in 2004. An inter-library loan and document delivery network with 46 core members was established in June 2004. The Technical Standards and Specifications of CADLIS were issued in September 2004. The service networks for thesis & dissertation (ETD), digital collections, e-reserves, virtual reference, etc., were set up in 2005. More libraries joined the CALIS Union Cataloging Group. At the end of 2006, the number of CALIS members reached 809. CADLIS became a national infrastructure for Chinese academic libraries. Between 2007 and 2008, CALIS was maintained, and CADLIS was improved and updated. The new version of application of Software as a Service2 (SaaS) model for digital libraries was developed starting in August, 2008. The CALIS Union Cataloging Group and the network for inter-library loan & document delivery continued to expand. The number of members reached 1,005 by the end of 2008. CALIS Phase-III , a national project of China's 11th Five-year Program, was proposed in August 2009, was formally approved and started in March 2010, and will end in 2011, with a total investment of 210 million Yuan RMB ($30.8 million US, approximately) from the Chinese Central government. A significant feature of this project is to apply cloud computing [3,7-11] technology to build next-generation CADLIS, which will provide service to all 1,800 Chinese academic libraries and universities. The main goal of the CALIS Phase-III project is to build the new-generation CADLIS by introducing a modern service philosophy and advanced technology (such as cloud computing technology). It will provide the digital library platform and solutions designed to help academic libraries construct, manage, share and search their resources, collect and integrate all kinds of resources and services from academic libraries and commercial vendors, and build a social and collaborative knowledge service environment of high-quality scholarly information for high education and research institutions. (1) Centralized Information Search Service (in a personalized and faceted style): CALIS will build the largest scholarly information search engine in China, containing more than seventy million records of all kinds of information such as bibliographic data, theses and dissertations, conference papers, preprints, courses, pictures, audio and video material, scholarly web pages, etc. All of these records can be linked to related full-text, abstracts, holdings, etc. (2) Delegated Discovery and Retrieval Service: Users can send requests for information to professional librarians from CALIS members, who can help find and deliver the requested material. (3) Document Acquisition Service: By providing services such as inter-library loan and document delivery, pay per view, print on demand, direct download, etc., CADLIS will help users to acquire information that they need. (4) Information Consultancy Service: Subject and reference librarians from CALIS members can help users identify digital and printed resources for their needs, introduce state-of-the-art bibliographic and reference tools, make strategic use of the relevant resources in their area of research, and provide science/technology retrieval services, selective dissemination information (SDI) services, other consulting services, etc. (5) Collaborated Q&A Service: This service includes instant message calls, collaborated reference service, automated question & answer service, Frequent Questions and Answers, wikis, etc. Its knowledge base is built cooperatively by CALIS members, and can be integrated with wikis and other knowledge bases. (6) Social and Communication Service: This service includes communities, blogs, personal information space, reviews and tags, and other Web 2.0 services, etc. (7) Authentication & Authorization Service; Federated Identity Service: CADLIS provides end-users (including users of the central service and local users from member libraries) with distributed identity management service and single sign on (SSO) service between local digital library systems of members and CALIS national or provincial centers via SAML and OpenID protocols. (1) Operational services: These services are provided by CALIS centers via a group of applications, such as the Union Cataloging service, Collaborated Consulting Service, Collaborated Acquisition Service, Delegated Discovery and Retrieval Service, etc. (2) SaaS Services: A group of applications (such as Inter-library Loan and Document Delivery, Reference system, Digital Collection system, E-reserve system, Identity Management system, ETD Management system, etc.) are designed and provided in the Software as a Service (SaaS) model. They are hosted, backed up and maintained by CALIS Provincial Centers, and can be used freely by libraries. (3) Interface Services: A group of open APIs are provided by CADLIS and can be 'mashed-up' and embedded in the local digital libraries of CALIS members. Conversely, central CALIS portals can mashup local services provided by local digital libraries via these APIs. (4) Data Services: Members can subscribe to and synchronize bibliographic records and other metadata from central collections of CADLIS into their local collections. Member libraries can provide central union databases with data from their local collections through the OAI-PMH protocol where objects are wrapped in the METS3 format . (5) Standards and Specifications: CALIS formulates and publishes a series of standards and specifications for digital libraries, issues guides for their application, and provides application testing and certification services for libraries and third-parties. (6) Staff Training: CALIS provides training courses and materials, certification exams for librarians, either through the Internet or on location. Librarians can learn on their own and test themselves. If they have any questions, they can get help from the Member Service Center (i.e. Call Center) of the National Administrative Center for CALIS. (7) Registry Service: All members need to be registered. All kinds of applications, services and collections both from central and local libraries need to be registered and can then be accessed automatically by local digital library systems of members. The CALIS easyCloud framework  (service-oriented architecture, based on cloud computing technology, OSGi4 and REST architecture) was first released by the CALIS Technology Center in early 2009. Applications of the new-gen CADLIS have been designed and developed based on this framework. The entire new-gen CADLIS consists of three levels of platforms: CALIS National Central Platform, CALIS SaaS Platform, and CALIS Local Platform. The National Central Platform is hosted by the National Administrative Center for CALIS, and provides services for all end-users and members. The CALIS SaaS Platform consists of a group of SaaS applications, and is hosted by some or all of CALIS Provincial Centers. Many libraries can lease these kinds of services freely and provide these services for their own users. The CALIS Local Platform can be deployed for building and maintaining local digital libraries. The CALIS National Central Platform consists of the following applications: Personalized Portal system (supporting the OpenSocial5 standard), the new-generation personalized CALIS union-catalog search service system (SaaS version) with more than 70 million metadata records (including books, journal articles, papers, theses & dissertations, pictures, video and audio, etc.) along with holdings records from members, Western Journal Articles Service system (SaaS), Union cataloging system, Collaborative Acquisition system, Centralized Identity management system, Centralized Cross-Linking system, Union Ancient Collection management system (SaaS), Union Institutional Repository System (SaaS) , Centralized E-reserve service system, Centralized ETD service system, Payment and Billing system, Digital Repository management system, Data Exchange system, Service and Resource Evaluation system, Personalized Recommendation system, Metasearch system, OpenURL Linking system, etc. In addition, this platform also provides member libraries with data services in Data as a Service Model. The CALIS SaaS Platform consists of the following applications with SaaS functionality: Portal system (OpenSocial-compliant), Identity Management system, Inter-library loan and document delivery system, Virtual Reference system, E-reserve management system, ETD management system, Digital Collection management system, Website Resource navigation system. Within this set, the Identity Management system is a core application. All of other SaaS applications can be integrated with it. The CALIS Local Platform consists of many standalone applications (including OpenSocial-compliant Portal system, Identity Management system, Metasearch System, OpenURL Linking System, Union-DB Search System, Inter-library loan and Document Delivery system, Virtual Reference system, E-reserve management system, ETD management system, etc. ), and is used to build local digital libraries by member libraries. These applications can be interconnected and integrated easily with each other, with other local applications in member institutions, and up to the CALIS SaaS Platforms deployed in the CALIS Provincial Centers, and to the CALIS National Central Platform deployed in the National Administrative Center for CALIS. For CALIS Centers, the infrastructure (including hardware, network, storage, OS, virtual machines, etc.) will be built in the model of Infrastructure as a Service (IaaS) by utilizing virtualization technologies. As such, the flexible, dynamic and scalable management of the cloud infrastructure will be achieved. The CALIS National Central Platform, CALIS SaaS Platform and CALIS Local Platform provide a group of open APIs (RESTful web services). There are four kinds of interoperability in CADLIS (see Figure 4): Interoperability between applications in the same platform, between CALIS Local Platform and CALIS SaaS Platform, between CALIS Local Platform and CALIS National Central Platform, and between CALIS SaaS Platform and CALIS National Central Platform. (1) Interoperability within the same Platform: Within the same Platform, the applications can be integrated with each other. All of them support SAML and the same authentication protocol. Thus, single sign on (SSO) among them within the same Platform is possible. For the Portal application, a group of gadgets (based on the OpenSocial standard) can access the rest of the applications, so all the information and services from these applications can be presented in the same portal, and be used by end-users via the gadgets in the portal. (2) Interoperability between the Local Platform and the SaaS Platform: CALIS member libraries can simultaneously adopt and deploy some applications of the CALIS Local Platform in their own libraries and lease some other applications from the CALIS SaaS Platform in some CALIS Provincial Center. For the latter case, the leased applications can be viewed as local applications. In this regard, they can be integrated with the local Identity Management System to support Single Sign On (CALIS SSO) and be embedded into the local portal in the form of gadgets. (3) Interoperability between the Local/SaaS Platform and the National Platform: Federated Identity Authentication between the CALIS Local/SaaS Platform and the National Central Platform has been achieved. All Identity Management Systems of the three CALIS Platforms support the same SAML-complaint federated protocol and OpenID6 protocol. When local end-users log in to the local portal (regardless of the specific local or leased Identity Management system), they can directly access the National Platform without logging in again. (4) Services Integration between the Local/SaaS Platform and the National Platform: Services provided by the Local Platform and SaaS Platform can be mashed up by applications from the National Central Platform, or vice versa. For data sharing among members, local data (including metadata, local holdings, and other resources) in local digital libraries can be harvested into the CALIS Central databases via the OAI-PMH7 protocol, and conversely, the data from CALIS Central databases can be subscribed to by libraries and synchronized automatically into their local databases. All of the repository applications (such as the ETD system, e-Reserve system, Digital collections system, Consultancy knowledge-base, etc.) support SRU8, OpenURL9 and RSS standards and thus can be integrated easily with Metasearch systems, OpenURL linking systems and any RSS feeders. Metadata can be wrapped in RDF/ATOM formats of the OAI-ORE10 standard. Linked data can also be provided by these applications and can be easily inter-linked to resources in other applications. CADLIS is not single digital library; rather it is an open, large-scale federation of digital libraries. Many applications in and between libraries need to be integrated. As a result, the Handbook of Technical standards and specifications for CADLIS needs to be revised and supplemented according to the new requirements in the CALIS Phase-III Project. The new version of the Handbook will contain 16 categories of standards and specifications, as shown in Table 1 below. The CADLIS Technical Standards & Specifications have been adopted by CALIS member libraries in order to develop special collection databases, to construct local digital libraries, and to integrate different types and levels of applications from local libraries and CALIS Centers. 1 Basics Spec for unique identifiers for digital resources; Spec for encoding resources and their types; Spec for registry of services, metadata formats, collections, repositories, applications and nodes, etc. 2 Metadata Spec for basic and extended metadata; Spec for descriptive, administrative and technical metadata; Spec for cross-mapping between different metadata formats, etc. 3 Union Cataloging MARC rules for Chinese print serial publications, music books, and western books; Rules for union cataloging of Japanese books; Spec for Chinese titles; The 2nd version of the Handbook of CALIS Union-Cataloging for Chinese Books, etc. 4 Digital Objects Specs for digitizing full-text, pictures, audio, video, courses, etc. ; Spec for composite objects, Spec for website resources; Spec for descriptions and packaging of resources in OAI-ORE, RDF/ATOM formats, etc. 5 Resource Organization Spec for knowledge organization (Web 3.0); Spec for collections of resources; Spec for classification within CALIS; Rules for mapping between CALIS Classification and Classification of China MOE (Ministry of Education); Rules for Mapping between CALIS Classification and Chinese Library Classification; Rules for Mapping between CALIS Classification and Dewey Decimal Classification, etc. 6 Resource Storage Spec for Storage and Management of Digital Resources, etc. 7 Resource Publishing Spec for Publishing Digital Resources; Spec for Data Indexing, etc. 8 Data Conversion A series of Specs for Data conversion between metadata in XML and MARC 2709, between private formats and general formats in union databases; between XML formats and RDF, between formats of METS and ORE, etc. 9 Resource Search Spec for general search language; Spec for metadata search; Spec for navigation of resources, etc. 10 Resource Access and Presentation A series of specs for accessing and presenting all kinds of digital objects (e-books, ETD, articles, courses, rubbings, atlas, audio, video, etc. ); Spec for linking resources, etc. 11 Interfaces Spec for unified and federated authentication and related APIs; Spec for APIs for billing and payment; Spec for logs and statistics; Spec for monitoring applications; Spec for APIs of e-reserve, ETD, union-catalog, virtual reference, journal database, etc. 12 Service Integration A series of specs for integration of inter-library Loan and document delivery, collaborative reference, union-cataloging, portals, special collections, e-reserve, linking system, billing and payment, evaluation system, etc. 13 Platform Development Basic spec for developing SaaS applications; Spec for client components; Spec for server components; Spec for N-servers. 14 Operations and Management Specs for basic operations of data and system management and maintenance, software license management, member management, domain-sharing management; Specs for professional operations of union cataloging, inter-library loan and document Delivery, ETD deposit and service, e-reserve, digital collections, virtual reference, etc. 15 Security of Data and Systems Security of data, applications, access, hosting, network, storage, etc. 16 Evaluation of Resources and Services General rules for evaluations of resources and services; Rules for evaluation of imported resources, special collections, books and journals, ancient resources, audio and video material, etc. ; Rules for evaluation of reference, inter-library loan and document delivery, acquisitions, etc. Digital resources in CALIS Phase-III projects should meet the needs of most academic libraries. They will cover the bibliographic data, metadata, and holdings of all CALIS members. Many native resources created in libraries and universities will be supported financially by CALIS and harvested by CALIS centers. In order to improve the distribution of the key resources in all academic libraries of China, and increase the availability of important resources for key disciplines, CALIS will continuously support and subsidize member libraries to purchase foreign databases cooperatively. Union catalog databases: including 2.6 million bibliographic records newly added by academic libraries and publishers. Union Database of Chinese Theses and Dissertations: including 800,000 papers (including starting-16-pages, abstracts, references) newly harvested from universities. Digital Collections: including three million items of native resources newly added by members and harvested by CALIS centers. Union Database of Ancient Resources (rare books, rubbings and atlases): including 800,000 items added by academic libraries. Website Collection and Preservation: More than 80,000 records of academic web pages will be collected and a subset will be preserved. Abstract Database of Western Journal Articles: including 30 million newly added records with holdings from CALIS members. Academic Distinguished Teachers Database: including 3,000 distinguished professors and researchers from universities, with contextual information and lists of their books and articles and links to their libraries. Consultancy Knowledge Database: including 50,000 items of knowledge and 1,500 manuals and training courses written by members. E-Reserve databases: including 100,000 metadata items about courses submitted by instructors and collected by libraries; also including 50,000 e-books associated with these courses. Imported Foreign Full-text Database: The CALIS National Subject Information Centers and Regional Information Centers as well as other core member libraries will be subsidized to purchase some important foreign databases from abroad. Reference Tools and Databases: Some reference tools and related databases will be purchased by CALIS for consultancy librarians to support their delegated reference service. In order to encourage teachers and researchers from universities to utilize CADLIS' services more frequently, CALIS provides members with certain allowances for document delivery and consulting services. 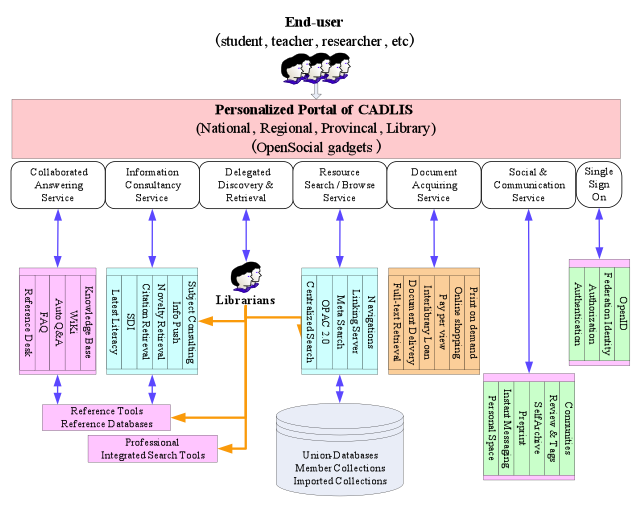 This article reviews the new-gen CADLIS of the CALIS Phase-III project aimed at increasing the variety, functionality, and scope of CALIS' services and resources both for end-users and academic libraries from 1,800 universities in China. Since the Phase-III project formally started only in March 2010, and needs to end within about two years, it is a great challenge for CALIS to lead and complete this project. The national and provincial centers will play a vital role in managing and providing CADLIS services for libraries, more than ever before. More member libraries are involved in large collaborative efforts to ensure the success of the Phase-III project. Different levels of scholarly cooperation and community building among scholars and librarians can be set up in personalized ways allowing educators, researchers, students and librarians from universities to more easily share resources with each other via CADLIS. It is fortunate that the new architecture of CADLIS with cloud computing technology had already been designed, and the corresponding CALIS easyCloud platform had been developed in early 2009. It is a solid technical foundation for developing new CADLIS applications quickly and effectively. Many new applications are being developed in the Software as a Service (SaaS) model, so as to significantly facilitate and accelerate the delivery of applications and resources from CALIS national or provincial centers to member libraries via the Internet with low information technology overhead for them. The new versions of the union cataloging system, centralized search engine and Western journal article service system with Web 2.0 and personalized features, union acquisition system, ancient collection system, etc. have been developed and have been on trial or in operation formally since 2009. More and more academic libraries have become users of these applications. The first group of SaaS applications (including the OpenSocial-compliant portal, federated identity management, inter-library loan and document delivery, virtual reference, e-reserve, digital collections management, etc.) have also been developed since the end of 2008 and will be released in the middle of this year. The training on how to lease and use these applications by members will be provided jointly by CALIS Technology Centers and Provincial Centers in the latter half of this year. Other applications of CADLIS will be completed and brought into operation over time. Special collections and other resources will be constructed cooperatively by members, and many important resources and tools will be imported jointly step by step till the end of next year. CADLIS is participatory. The digital library and academic communities have created and will continue to create extensive digital resources and contribute more to CADLIS. Researchers and librarians can benefit greatly from resources and services provided by CADLIS and share expertise. Through the development of the Phase-III project, CALIS will further ease access to, and the use of, the ever-expanding set of digital resources, and significantly enhance the ability of its members to meet the increasing needs of digital libraries for higher education. This material is based upon work which the National Administrative Center (NAC) and the National Technology Center (NTC) for CALIS has done during the preparation and development of CALIS Phase-III projects funded by the Chinese government (the Ministry of Finance and the Ministry of Education) since the end of 2008. The authors first thank Professor Zhu Qiang, Director of Peking University Library and Vice Director of CALIS NAC for his direction and support to the CALIS project. The authors would like to thank Mr. Zhang Yuexiang, Chen Pengfei, Zhu Chongbin, Chen Jinli, Li Xirong, Chen Feng, Yu Yang and Wang Meng, (as sub-project managers, system analysts, or development managers) especially for their distinct contribution in designing and developing the architecture and key applications of CADLIS, and thank all other colleagues of CALIS NAC and NTC for their hard work in the building, operation, maintenance and support of the new-gen CADLIS. Finally, the authors would like to thank all librarians from member libraries for their help and contributions to CALIS and CADLIS. 2 Software as a service (SaaS): http://en.wikipedia.org/wiki/Software_as_a_service. 3 Metadata Encoding and Transmission Standard (METS): http://www.loc.gov/standards/mets/. 4 OSGi Service Platform Core Specification Release 4.1(2007): http://www.osgi.org/. 7 Open Archives Initiative - Protocol for Metadata Harvesting: http://www.openarchives.org/pmh/. 8 SRU: Search and Retrieval via URL's: http://www.loc.gov/standards/sru/. 9 OpenURL: ANSI/NISO Z39.88 - The OpenURL Framework for Context-Sensitive Services: http://www.niso.org. 10 Open Archives Initiative - Protocol for Object Reuse and Exchange: http://www.openarchives.org/ore/. Wang Wenqing: Building China Academic Digital Library Information System (CADLIS): A Review and Prospect. Journal of Digital Library Forum, No.12, p.21-23, 2008, doi:10.3772/j.issn.1673-2286.2008.12.006. The National Administrative Center for CALIS: The Proposal for the Phase-III Project of China Academic Library Information System (CALIS) of China 11th Five-Year Program. Aug., 2009. Wang Wenqing, Chen Ling: The Model of CALIS Cloud Service Platform for Distributed Digital Libraries, Journal of Academic Libraries, Vol.27, No.4, p.13-18, 2009, http://en.cnki.com.cn/Article_en/CJFDTotal-DXTS200904005.htm. Longji Dai, Ling Chen, and Hongyang Zhang: China Academic Library and Information System: An Academic Library Consortium in China. Information Technology and Libraries, Vol. 19, No. 2, p.66-70, 2000. Yao Xiaoxia, Chen Ling and Dai Longji: Current Situation and Future Development of CALIS. Library Management, issue 6/7, p.277-282, 2004. National Administrative Center for CALIS: Handbook of Technical Standards and Specifications of China Academic Digital Library Information System (CADLIS), First Edition, Oct., 2004; Supplement and Revision, Oct., 2008. Brian Hayes: Cloud Computing, Communications of the ACM, V.51 No.7, July 2008, doi:10.1145/1364782.1364786. Tim O'Reilly: Web 2.0 and Cloud Computing. Dec.,8,2009. http://radar.oreilly.com/2008/10/web-20-and-cloud-computing.html. Vouk, Mladen A: Cloud computing - Issues, research and implementations. Proceedings of the International Conference on Information Technology Interfaces (ITI'08), June 2008, p.31-40. Fielding, Roy T.; Taylor, Richard N.: Principled Design of the Modern Web Architecture. ACM Transactions on Internet Technology, Vol.2, Issue 2, May, 2002, p.115-150. doi:10.1145/514183.514185. Dr. Wang Wenqing is the Chief Technology Officer of the National Administrative Center for CALIS and the head of the National Technology Center for CALIS since 2002. He has been in charge of the software design, development, implementation, maintenance and support of China Academic Digital Library Information System (CADLIS) of CALIS Phase-II and Phase-III Projects. He is Deputy Editor-in-Chief of "Technical Standards and Specifications of China Academic Digital Library Information System (CADLIS)". He received a Ph.D. in Computer Science from Peking University, Beijing in 1995. Professor Chen Ling is the Vice Director of the National Administrative Center (NAC) for CALIS and the Deputy Librarian of the Peking University Library. He led the software design and development of the CALIS Phase-I Project between 1998 and 2001. He has been the Executive Vice-Manager responsible for the CALIS Phase-II and Phase-III projects since 2002. He is the Editor-in-Chief of "Technical Standards and Specifications of China Academic Digital Library Information System". He was the Vice Director of the Mechanics Department of Peking University between 1996 and 2000.